Adventures are the part of life and road trip is one of them. One should take the experience of road trip so as to feel like a bird that is set to explore the unexplored heights of the limitless sky in any direction to any amount. But, yes, there is a but to it too..
Any road trip is effective and adventurous only when you have the right amount of adrenaline pumping unexplored tracks before you .. the ones which will send blood racing to your head and the ones that will actually test – What you are made up of. One such track is the deadliest and fearsome road of the recent mountains - The Himalayas - Sach Pass, Pangi Valley, Spiti Valley and Kinnaur. This road trip will not only test your driving skills but also your daring nature as you are bound to come across the endless waterfalls, non – existent and unpaved roads, snow walls and waterfalls. To get blessed with this adventurous motorcycle experience, I and my four friends decided to go for it. 5 bikes, 5 drivers and high spirits are all what we had to set on these deadly roads to fuel our lust for adventure. We knew that this will be a once in a lifetime experience for us. So, here are the details of the exciting motorcycle adventures we just came back from. 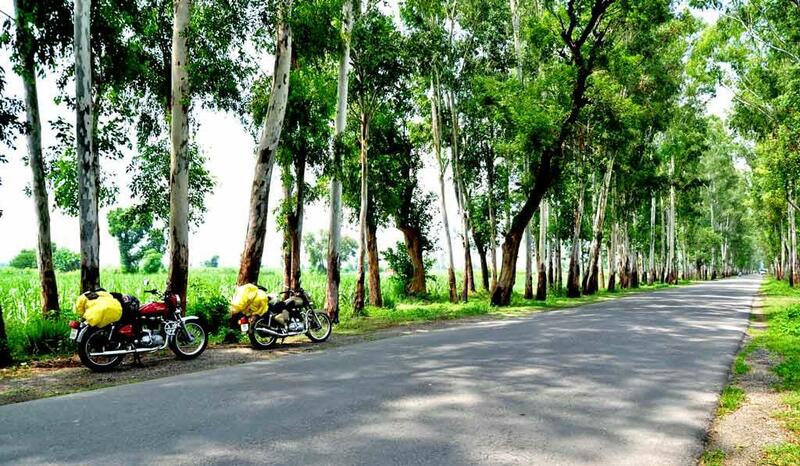 Delhi-Ambala-Jalandhar-Pathankot-Dalhousie-Chamera lake reservoir-Tissa-Bairagarh-Sach pass-Killad-Udaipur-Keylong-Khokshar-Chattru-Chandratal lake-Kunzum pass-Losar-Kaza-Key-Kibber-Tabo-Geu village-Nako-Kalpa-Rampur-Shimla-Solan-Ambala-Delhi. Though we were quite clear that we just had to go there, we were to arrive at an affirmative nod (all of us) on the question of "WHEN". We are real people. We have got lives and obligations and responsibilities. I mean, no one could just have picked up the travel bags and said – "I am in.. lets move". 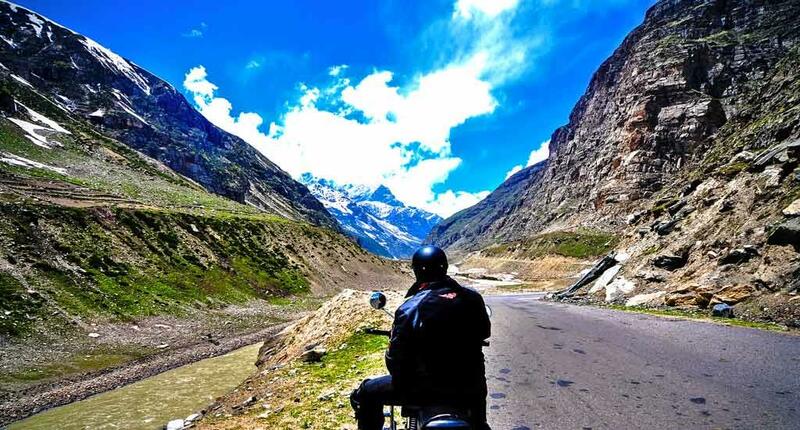 Dear all, hear it from an experienced traveller and a lover of adventurous exploits that along with the best route, it is also important to know the best time to commence any trip; Especially road trip and extra-specially the motorcycle adventures in Himalayas. I mean, the terrain, the weather, the season and the overall atmospheric conditions will be a major detrimental factor in deciding the fate of your trip as well as yourself. 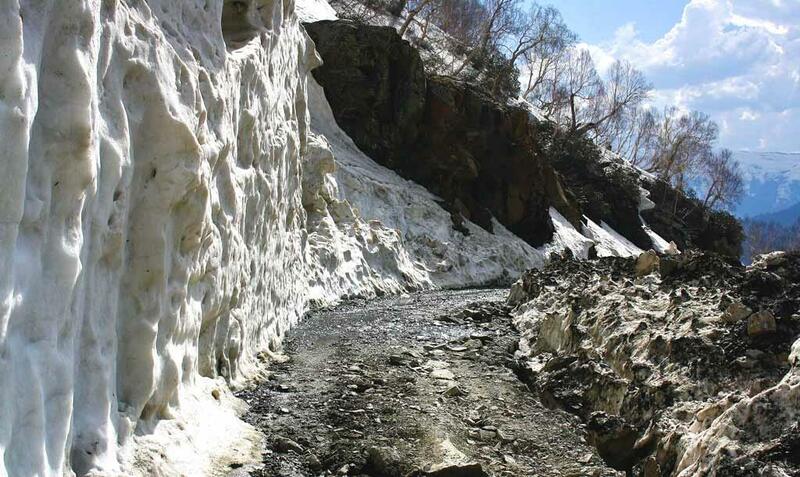 The Himalayan climate and terrain is known for its deadly sins of landslides, heavy rains, road blocks, total cutoff from the 'OTHER, LIVE' world for months (not days even). So, the planning is necessary. Hence, after a huge discussion and speculation period, we arrived at the decision that the best time to visit is before monsoons i.e. late June or early July. It was important for us to cover this journey before the commencement of the monsoon season which would set the mud loose and raising havocs on the already dangerous roads. So, fellas, this is what our cute little Itinerary looked like for the adventurous mammoth we wished to tame. We had started our journey from Ghaziabad and decided to stay Ambala which is around 200 kms from Delhi. The weather conditions are awesome as we had started our road trip in the night. After reaching Ambala, we took some rest and had dinner. Road Conditions: Amazing road conditions as we were driving on NH 1. The road really keeps you going. Well, after covering this long distance, we were super tired and crashed in a decent accommodation in Dalhousie. Road Conditions: As we had entered in the Himalayan region, it was expected that the roads are going to get a bit trickier. But they were in good condition and thus, the driving was not at all impeded. Stay: We had to pay Rs 2500 for two rooms. Now, it was the Day 3 of our journey and we were quite excited as we had already entered in the Himalayan region. Our journey of Day 3 began from Dalhousie and ended in Bairagarh via Koti and Tissa. The total distance from Dalhousie to Bairagarh is about 135 kms. On the way, we came across the Chamba valley which is famous for its silence and peace. We spent a few lazy hours in the lap of the luxurious Chamba Valley and clicked several photographs which are now the part of our unforgettable memories. Then, our Day 3 journey ended at Bairagarh where we took some rest. As a biker, it is important to take care of our bikes. The fuel in the bike should be completely filled so as to avoid any kind of problem at the time of road trip. Always check for the punctures, the treading on the wheels and other essentials before setting out every single day. Road Conditions: The road from Dalhousie to Koti was good but afterwards it is bad. And yes, we so wanted to travel and explore the same. On the Day 4, we finally had the opportunity to land our first foot on the road of our dreams (all smirks are welcome). We started from Bairagarh and headed to Sach Pass and Killad. After Bariagarh, the roads are quite dangerous and are considered as one of the deadliest and fearsome roads in the Himalayas. The weather conditions were quite contrary from what we expected as it was drizzling with light rains at some places and we were expecting a fine sunny day. But as they say, where is the fun in the common and usual. The rain was getting heavier with every kilometre and we had to finally stop at Satrundi check post. The road conditions were now getting worse and, the real adventure had begun. After 1 hour, the rain was over and we again started our journey to finally reach the much anticipated land of the Sach pass. We were cold after driving in the Himalayan rain and enjoyed a few warm-up minutes while enjoying the majestic surroundings and awesome weather. We were getting a feel that it was one of the best trips we have ever had till date and had an amazing travel from Sach pass to Killad. Due to rain, the roads were full of muddy water and puddles but finally, slowly and steadily, we won the race and the reached Killad (final destination for Day 4). The day felt like two, we had cramped neck and shoulders and really needed some good rest to gear up for the next day. Road conditions: Very bad road, non – existent roads and one needs a brave heart to drive on. Don't go in a rough weather as you might get yourself hurt or stranded. Now, the REAL adventure had begun as the roads were like an illusion of the same and the journey was a time-consuming and attention demanding task. Our adrenaline pumps were busy like 24X7. Our day 5 journey had started from Killad and ended at Keylong. We reached Udaipur which is a small but beautiful village located in Lahaul and Spiti valley. From there, we headed towards the Triloknathji which is the religious temple. Thereafter, we headed towards the main destination of the day 5 i.e. Keylong. It is advisable that the bikes can be filled from Tandi petrol pump so as to avoid any problems regarding the fuel. You must note that the petrol pumps are really far flung in the interior regions and you must track the oil levels attentively. Carrying additional refill is advisable. Road conditions: From Killad to Udaipur, the road conditions are quite bad with totally unpaved roads but from Udaipur to Keylong, the road conditions are quite good. On the day 6, we had started our journey from Killad and headed towards the Khokshar. There, the road conditions are quite good and one can easily drive on. But, the roads after khokshar are quite bad. Again, we came across the non – existent and unpaved roads which proved quite adventurous and excited us all the more. Finally, driving on these treacherous roads, we had reached to Chattru and took some rest. It is our Day 7 of the journey but we were excited as on the first day. Our journey had begun in the early morning as we had to pass pagalnull asap. After crossing that nulla, we headed towards Batal which is about 2 to 3 hours drive from Chattru with totally bad road conditions. From Batal, we moved towards the Chandratal which is quite popular for its Chandratal Lake. This lake is about 4300 meters in the Himalayas. 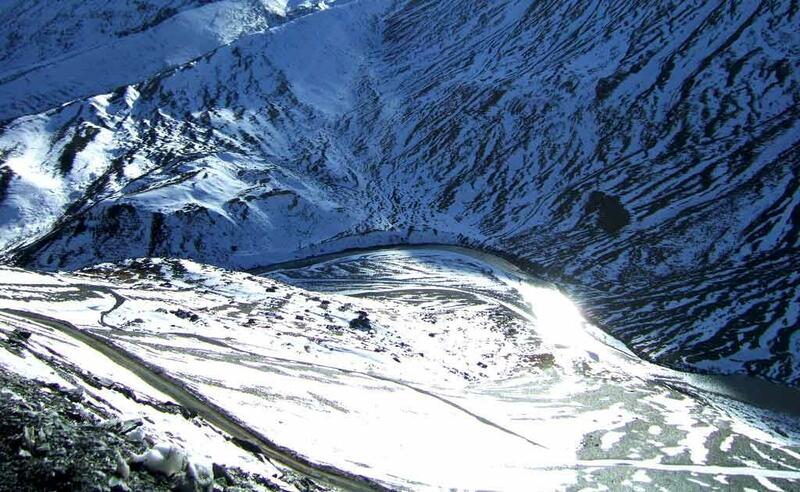 After Chandratal, we headed towards the beautiful Kunzum pass which is at the height of about 4950 meters. This pass connects Spiti valley to Kullu and Lahul valley. We had started our journey from Kaza (the coldest desert), in the early morning and headed towards the next destination i.e. Nako. On the way to Nako, we had first reached towards the Key monastery which is located at the height of 4166 meters. 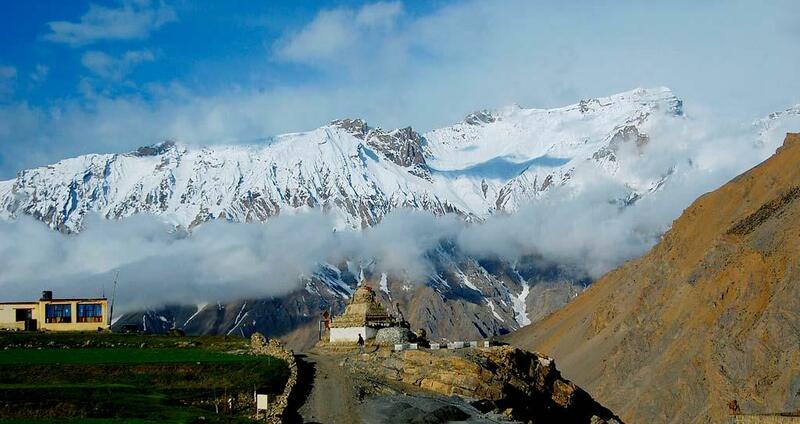 This is the largest monastery of the Spiti valley and situated at the distance of 14 km from kaza. After getting some seconds to catch up and reflect on the journey at Key Monastary, we had reached to the Kibber which is at the height of 4170 m and about 7 km from the monastery. After Kibber, we headed towards the Nako and Geu village. Geu village is quite popular for the natural preserved mummy. This mummy is around 550 years old and founded by the ITBP rescue officer in the year 1975. After visiting Geu village, we headed towards the Nako village at Kinnaur district. Stay: Rs 800 for one person i.e. Rs 4000 for 5 persons. This was the last day of our adventurous motorcycle trip. We had to reach Delhi at any condition. The total distance between Tapri to Delhi is about 560 km. the road conditions are good from here and travelling from Shimla to down in the plains was quite easy and fun as our bikes were gliding and rolling on their own down the hilly slopes. The travel was enjoyable and we grabbed a bite at a place with a name familiar to us. We reached Delhi by the dusk. This road trip was unforgettable for us. The weather conditions we had faced during this trip, the local people who had supported us, the places where we wanted to visit at least once in life, the food we ate, all the experiences were quite amazing and cannot be alliterated. This is the best experience of my life till date. Well, what's more to say, if YOU want to test your motorcycling skills in the most adventurous and fearsome roads then don't think, just GO for it. Vroom..Vrooom and VROOOOOMMM..!!! !